I'm one of those people who wishes it was always fall and come September 1st my house will be fully decorated with pumpkins and bats. But who says you can't start celebrating a little bit early this year. 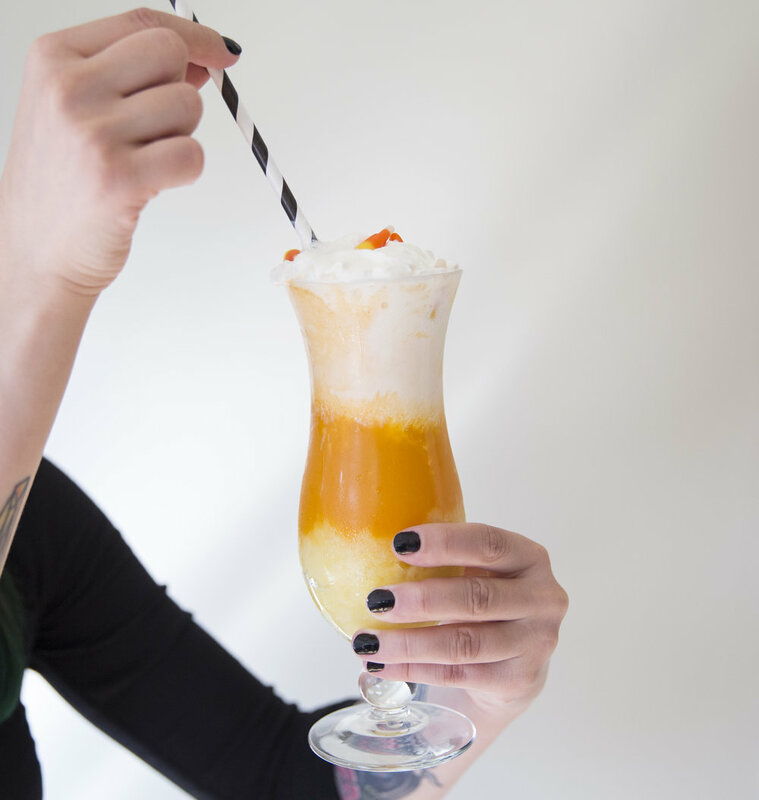 This layered candy corn inspired float has the delicious fruity flavors to help you cool off in the summer heat while looking adorably creepy (and 'grammable) - and before you ask, no, it does not taste like candy corn but more like a tropical creamsicle. While I love candy corn as a concept, the taste usually leaves a bit to be desired in my opinion... although I know this is a very divisive issue. Regardless of your take on fall's most notorious sweet I'm sure you'll love this delicious drink. It's just as good boozy as it is without so spooky kids of all ages can enjoy! Oh, did I mention all of the ingredients are natural and no food coloring is needed to make this colorful cocktail? Even better. Blend frozen pineapple with 3 tbsp. water or milk of choice until smooth and allow to sit out for a few minutes to soften. Scoop pineapple mixture into the bottom of your glass and smooth out the layer. Next add the juice. If making a boozy version mix one shot of rum with about 4 oz. mango or peach nectar and pour into to the glass, which should sit above the pineapple layer. Add one scoop of vanilla ice cream to the top layer. It should float due to the fat content - like magic! Next add a bit of whipped cream and candy corn if desired.